I can only recall Vaness Wu as one of Taiwan’s F4 from the uber famous Meteor Garden (though I haven’t seen it). He proved to be a more serious actor and not to mention a hunk with his last projects. 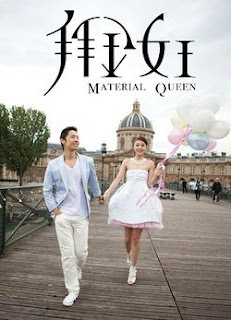 Material Girl seems to be a nice TwDrama filmed in Paris, oh I would love to go there! For the meantime I’ll watch MG.
Lin Chu Man is a fashion model who does not prejudice against a man for being short, fat, ugly and old, as long as he is rich. So when she discovers that the young, handsome, wealthy "Mr. Norman" is only a hired body double for the real Mr. Norman, and his true identity is a penniless music student in Paris named Cai Jia Hao, she immediately dumps him. As karma would have it, she loses her job to a younger model, her rich lover kicks her to the curb and she finds out Cai Jia Hao will be her new roommate. Lin and Cai's unexpected living arrangement forces them to reconcile and to really get to know each other. As Lin becomes closer to Cai, despite her aversion to penniless man, her goal of nabbing Yan Kai Ming, a real estate tycoon, become less of a priority. And, she starts to question whether being happy equates to being rich. Yuuki, san ka pala kumukuha ng mga yan? DVD or torrent download? Thanks!